This Easy Fast Shrimp Lo Mein is so good, so fast and so simple that you’re going to be thinking back on all of the restaurant and take-out meals of Shrimp Lo Mein you’ve had over the years and you’re going to feel a bit cheated. But then you’re going to realize you can make this at home in about 20 minutes and you’ll get over it. While I made my Easy Fast Shrimp Lo Mein with Shrimp (obvs) and broccoli, bell pepper & matchstick carrots, you’re not limited to that combo. The sauce for this Lo Mein is so scrumptious, you can use it if you want to make any Lo Mein, steak maybe or chicken and any veggies you like using this same sauce. Lo Mein really is all about the sauce, and this one’s like magic. So simple and so delish! It’s just the perfect thing to coat those noodles and transform those veggies into deliciousness. Easy Shrimp Lo Mein is a great recipe to serve to the fam when you’re trying to get them to eat more veggies. They might go for the shrimp and the noodles first, but then they’re bound to at least accidentally get a few of those veggies tangled in those lovely noodles and they’re going to get how delicious they are. Real Cantonese Lo Mein is a bit different than our typical restaurant style Lo Meins like this Easy Fast Shrimp Lo Mein, but there’s hardly a better dish to introduce your family and friends to Cantonese food than this one. Some say Lo Mein is one of the most popular Chinese Take Out dishes. I know my folks went nuts over a variation I made for them a while ago. When you get ready to make this recipe, start with the noodles (and I’ve gotta mention, this is a great recipe to use if you have leftover spaghetti noodles in the fridge – then it’s even faster!) and by the time they’re done, you’ll have everything else ready to go. You’ll want to make the veggies and shrimp in a large pan so you have enough room to toss the noodles in with everything else, and you’ll want to make sure your noodles are just shy of al dente. They’re going to cook for that last minute in the sauce so they’ll absorb that yumminess! And of course, just a note, don’t overcook your veggies at the start (or your shrimp) because they’ll keep cooking as the noodles are tossed in. Choose any veggies you like. I picked the broccoli, peppers, and carrots because they’re so common in Lo Mein and everyone I know loves them, but other good candidates are cabbage, mushrooms, snow peas, Chinese broccoli, greens, scallions, bamboo shoots, and water chestnuts. For the noodles, yes, you can use Lo Mein noodles, either fresh from the refrigerator section or dried. I just used spaghetti because when I decided to make my Easy Fast Shrimp Lo Mein that’s what I had in the cupboard. And that just shows how easy and forgiving Lo Mein is. Just decide to make it and raid the fridge and pantry and whip it up. That sauce is just like a blank palette for you to add what you love and/or have on hand. Unless you live near an Asian market, even if you have Lo Mein noodles available, they’re likely to be a bit pricey in comparison to most other kinds of pasta. For some of you, I know that’s not a biggie and isn’t likely to break the bank, but if you’re looking for an easy, readily available option, spaghetti or even better, linguini works great in any Lo Mein. My Easy Fast Shrimp Lo Mein is mostly veggies with just a little shrimp to accent the recipe. That’s actually a great way to stretch any recipe and it makes just about any recipe healthier. I buy my shrimp strategically and since I’m in Minnesota, frozen is the best option. I pick it up at a low during Lent, and I check around the Christmas and New Year’s sales, too. By then, even though I tend to use shrimp sparingly, my Lent supply is running low or gone, and you don’t want to keep shrimp too long in the freezer. Safety wise, it’s just fine, but it can get dried and the quality might not be as good after several months. If time allows, I thaw the frozen shrimp overnight on a layer or two paper towel, loosely covered. As you know, some veggies can be a lot more than others. Not only are the veggies in my Easy Fast Shrimp Lo Mein basic, common veggies available almost everywhere, but they’re also pretty inexpensive. Broccoli might go on sale in your area. Bell peppers do go on sale where I live. Generally, the red, yellow & orange peppers run twice as much as the green bells, so choose accordingly…I like to buy my peppers on sale, enough for the current week when they’re on sale and enough to use the following week. They keep pretty well for a week or two. Drizzle a large skillet with oil. Over medium-high heat, add the broccoli stems and carrots, cook for about 2 minutes. Add the bell peppers and broccoli florets and cook for three to four minutes; they should still be a little crunchy. Make a space in the center and add shrimp, cook two minutes or so, then flip shrimp over. Add the sauce and bring to a simmer, cooking until the sauce has slightly reduced and shrimp is just cooked through. Remove skillet from heat and add noodles, tossing and turning over to incorporate the shrimp and vegetables and coat the noodles with the sauce. Serve immediately, garnished with green onion or cilantro. Note: If the stove isn’t hot enough while stir-frying vegetables, add lid for a minute or two. This entry was posted in Click here for Bargain Meals, Click here for Fabulous Food Posts and tagged Asian, Bell Peppers, Broccoli, Carrots, Chicken Stock, Chinese, leftover pasta, lo mein, Pasta, Shrimp, spaghetti. Bookmark the permalink. Oh yummy! I have been wanting an easy lo-mein recipe for ages. This sauce sounds very easy and simple! It is fun and for being so easy pretty darned tasty! Well, anything with shrimp, lol! Thanks! Love this– quick and delicious!! And it looks so pretty in the pan! Our daughter’s in-laws are Cantonese– wonder if they’d like this next time I”m up there! hugs hugs Mollie! I think I told you about my (this is complicated) my step brother’s wife is from China. Every time she looks at one of my recipes, she says no. ANd not just once, no, no, no, no, no. lol! Guess she’s not into our more fusiony American Chinese recpes!! But I have learned a few things from her! I get it! Our Jodi makes real Chinese food and it’s not what you see at Panda Express!! But I like it a lot (except for the chicken feet!– must be an acquired taste!) In China, some students took me out for stewed turtle (shell and all). hugs!! It’s so sad that everyone in our house, except me, is allergic to shrimp! Oh my gosh! Normally, I’d think more shrimp for me, but I know how serious those allergies can be. You probably dont even want it in the house! And thanks for hosting! It’s is very very dark and more intense in flavor without being more salty. I think it has a lot of the “umami” flavor that regular soy lacks. The difference between regular soy and dark soy is kind of like the difference between say Balsamic vinegar and a Balsamic vinegar reduction. Oh fascinating! The comparison to balsamic is a great one. Love it! Love the sauce! Hi Mimi! Thanks. It’s so simple and so good. Lo Mein is one of the things I order out and now I have a great version to make at home. Your pics are drool-worthy! The beauty of this is you can make it with whatever you want…even if the cupboard is bare, lol! I also came home with a whole fresh chicken. I’m thinking chicken and dumplings on the weekend. And possibly Viennese swirl biscuits. Yum! I have had chicken and dumplings on my mind ever since the cool weather hit!! Never go shopping when you’re hungry … gee I wonder why they say that? It seems that you can hardly walk out of the grocery store anymore w/o spending 50 bucks! Prices are rising at a crazy rate, at least where I live in MN! I think I need to do a “pantry clean out” and really concentrate on using what I have on hand in my pantry and freezer and then just pick up fresh veggies as needed. I have been doing a pantry clean out for the last couple of months and now it’s empty enough that I’m getting a big nervous. So I came home with 2 pkgs of noodles … thin egg noodles for chicken soup and the lo mein. When things don’t fall out when I open the door and I can see all the way to the back, I feel like I’m letting my mom down. Oh gosh, you made me laugh! I usually try to have enough of something to last me until I think the next sale will be but even though I’ve been back from the folks’ house for a year this week, I still haven’t gotten things together – in the kitchen or elsewhere. I just ran out of steam. I brought back several boxes of pantry stuff and just shoved them into the high cupboards. And then there are all the closets and stuff that’s still jumbled from the burglers. I don’t even open those doors! I guess I have some winter projects! Wishing you all the best on your closet etc sorting. I don’t do large sale purchases since I’m only cooking/baking for one. I check out the flyers every week. Sometimes I don’t go shopping at all that week (except if I run out of milk) cause there are ALWAYS ‘sales’. It’s so good, isn’t it! Next to lobster, my fave seafood! 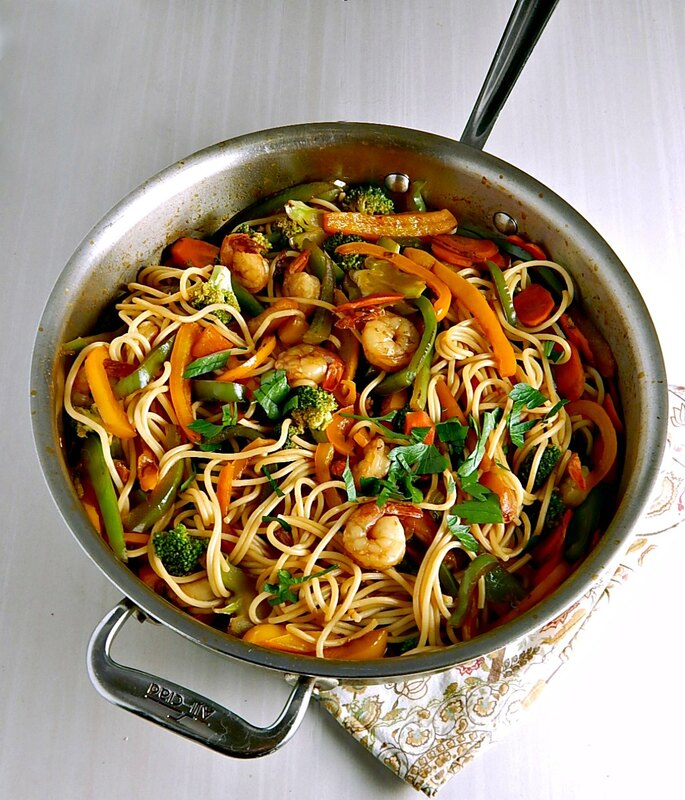 I don’t care for lo mein generally, but I do love shrimp and yours looks quite delicious. Thanks. Actually, I didn’t like it too much until I first made it at home! Most restaurant lo mein never feels fresh to me! Great quick recipe. We get it at our takeaway here all the time, but it’s called Stekta nudlar med räkor (Fried noddles with shrimp). It’s one of those things you think why make it, but at US$12/ per order, perhaps I should use your frugal recipe and save a few kronor. It sounds like it’s gotten just about crazy expensive to eat out everywhere! And then if you toss in a beverage and a tip, on top of that! This is a fun recipe to play with, and I love my Steak Lo Mein, too. That sauce is a little more complex.